Ann Major carefully mixes chocolate-dipped pineapple hearts with plump strawberries, grapes and thick orange slices into a tasty bouquet. The bouquet reveals a mix of ingenuity and patience, each piece of fruit skillfully cut and arranged. Allie McCormick dips long banana slices in milk chocolate to finish off the arrangement, cooling the fruit in a freezer for seven minutes. McCormick, fond of the chocolate dipped oranges, enjoys sampling the tasty fruit. “It’s fun and different as a gift idea,” McCormick said. 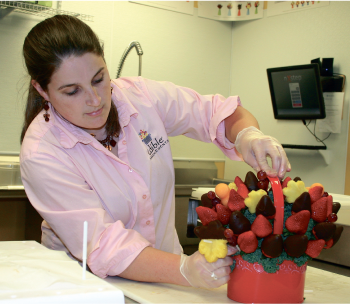 Major said Edible Arrangements, a chain with more than 1,000 stores worldwide, opened in Wyndhurst three years ago. The business, owned by Michael Anich, continues to expand. Employees handcrafted 400 fruit arrangements for Valentine’s Day. Major said the brightly colored fruit arrangements are comparable in cost to flower bouquets. On busy days, five or six employees hand-cut each piece of fruit in a large kitchen, arranging the sweet smelling baskets according to specific styles. During holidays, 10 to 15 people share the heavy workload. The company offers a variety of arrangements, depending on fruit favorites and cost. Typical baskets range from $35 to $55. “Each year, it picks up,” Major said of sales. The arrangements are given a unique name and ingredients. The “Berry Chocolate Bouquet,” includes pineapple hearts, chocolate dipped strawberries, fresh strawberries, pineapple daises and grapes. Major, who has worked at the store since it opened, said each arrangement takes 15 to 20 minutes to make after cutting fruit. The business plows through fruit quickly, using 2,000 strawberries a week. Major, who prefers chocolate and peanut butter dipped bananas, said employees use special molds and cutters to shape the fruit. Edible Arrangements recently began selling “pineapple pops,” large chunks of the sweet fruit cut into bunny, star, or heart shapes and dipped in chocolate. The pops are served on a stick. Major expects “chocolate bark,” pieces of solid chocolate sprinkled with almonds or white chocolate drizzle, to become a popular item. The company offers arrangements to suit any occasion, mixing balloons, cards and teddy bears with orders. Major said the company delivers many orders to Liberty and other Lynchburg colleges. The company delivers to Appomattox, Bedford, Rustburg, Madison Heights, Evington, Amherst and Altavista for $15. Lynchburg delivery costs $12. Major likes greeting customers with a fruit bouquet. Located at 1627 Enterprise Drive in Wyndhurst, Edible Arrangements is open Monday-Friday, 8 a.m. to 7 p.m. and Saturday, 8 a.m. to 5 p.m. The company also takes Sunday orders. Orders can be placed by calling 434-239-2424 or online at ediblearrangements.com. is written by means of him as nobody else realize such specified approximately my trouble.